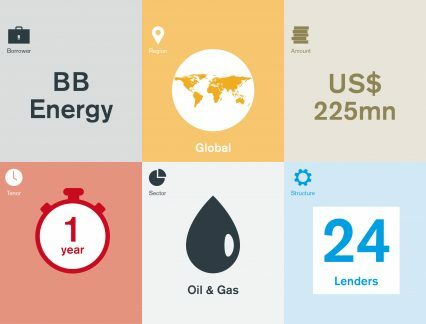 Energy trading company BB Energy has closed its revolving credit facility at US$225mn to refinance last year’s US$200mn facility and for general corporate purposes. The facility was initially launched in a limited syndication at US$200mn on August 24. Being 80% oversubscribed, it took on an additional US$25mn whilst still scaling back lenders’ commitments. The deal has a tenor of one year, with a 364-day extension option, at each lender’s discretion. Mandated lead arrangers and bookrunners were Abn Amro, Credit Suisse, Rabobank and Standard Chartered. They were joined by First Abu Dhabi Bank, Natixis, UBS (prior to the launch of the syndication), Commercial Bank of Dubai, Bank of China, HSBC, ING, UniCredit and Société Générale as mandated lead arrangers. Lead arrangers were Bank ABC, Banca UBAE, BACB and Garanti Bank, while arrangers included Citibank, Deutsche Bank, Europe Arab Bank, Federated Project and Trade Finance Core Fund, Raiffeisen Bank and Credit Libanais. As of today, the company has aggregated trade finance facilities with top tier international trade finance providers in excess of US$3.5bn.